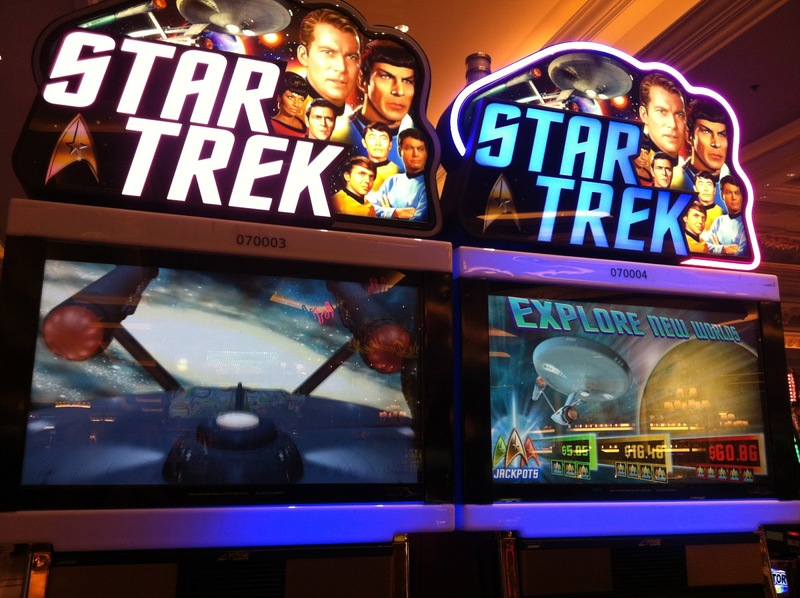 geek with curves: Hello, Vegas: Show me your geeky slot machines! 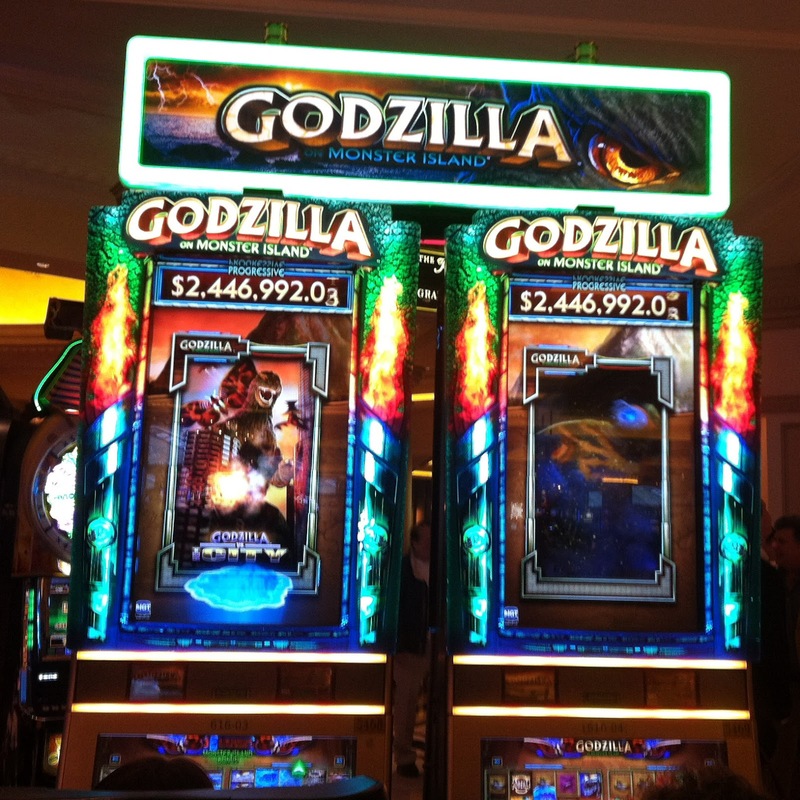 Hello, Vegas: Show me your geeky slot machines! Las Vegas isn't exactly my sort of town but at the same time, it is. I'm not big on gambling, drinking to excess, or partying in loud clubs, and those are probably the three primary reasons people travel to the city that never sleeps (or is it sin city?). But. It is like Disneyland for adults and I can relate to that aspect. Each hotel is themed from the carpet to the floral arrangements to the outfits of the cocktail waitresses. The food is diverse and delicious, the shows are flashy and over the top, and Vegas may have more fake interior skies than all of the Disney theme parks put together. Seriously - that city is the definition of spectacle. I always have a blast. 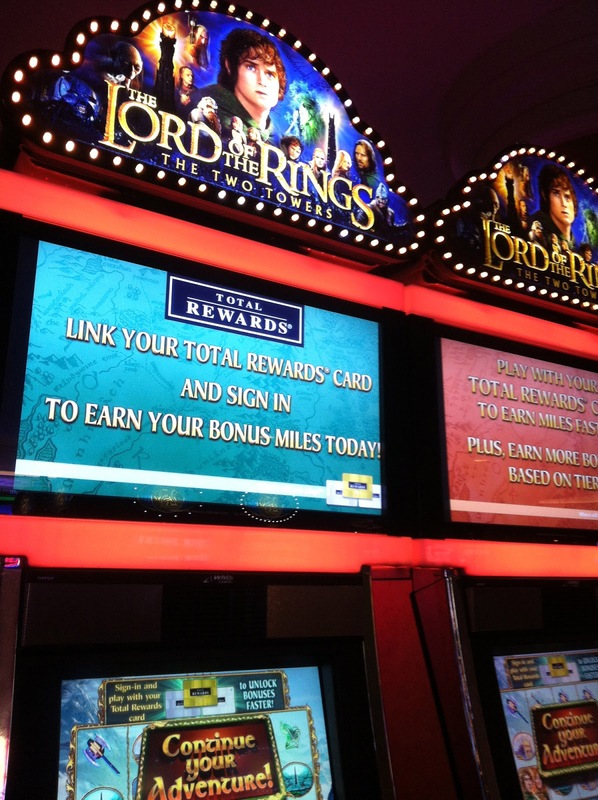 On a recent visit around Thanksgiving, I spotted a Lord of the Rings slot machine in Caesar's. I knew there were Star Wars ones in the airport too, and I figured there had to be more around the strip. 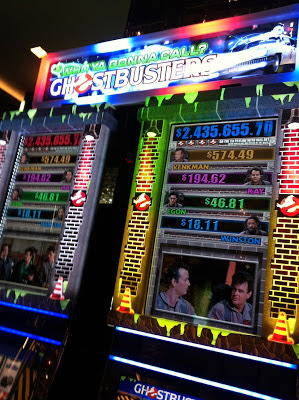 So to add fun I made a game of looking for machines with geeky themes. It was a way to break up the monotony of strolling through casino floors - that part of casinos tends to look the same no matter where you are - and I spotted more than I figured I would. 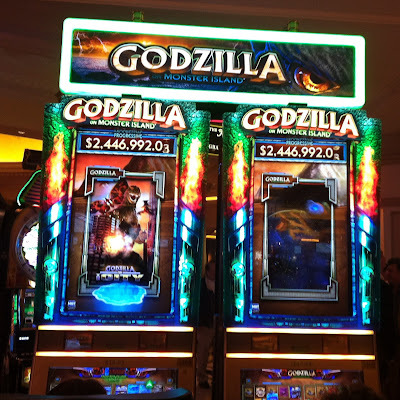 I slacked on making note of where I saw everything, but I think slots move around anyways so the list probably wouldn't be accurate for long. 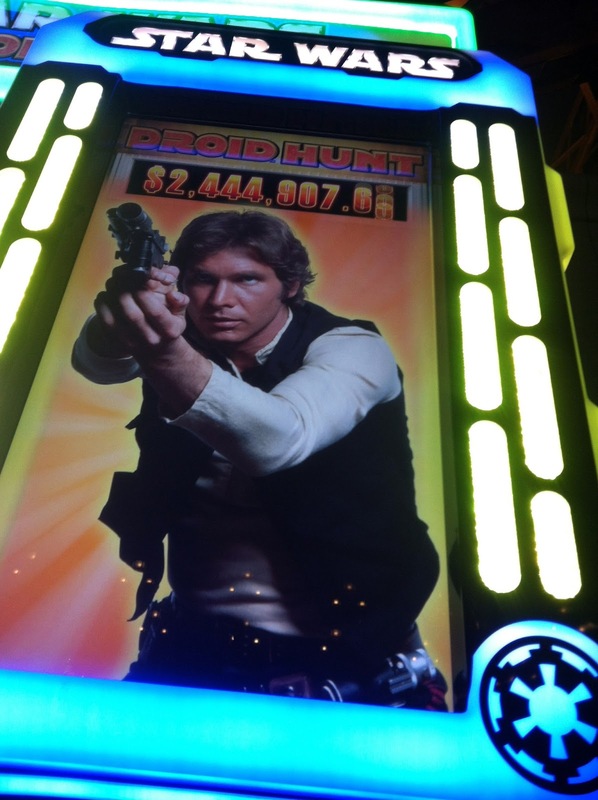 This Star Wars machine ate all of my dollars in no time. Like the money practically walked out of my hand. The lady next to me must have been in cahoots with Darth Vader though because it was luckier for her. I remember this Lord of the Rings was in the Paris casino. I didn't get to play because people were sitting at it before and after I went to dinner, but I stopped to admire the detail of Saruman and Gandalf's staffs at the top of the machines! Before this trip to Vegas I'd only played a handful of generic slot machines. Like the kind with lines of cherries. Watching this Star Trek game and some of these others was my first experience with video slots. It's like playing video games while spending all your money, which I suppose is how they get you. 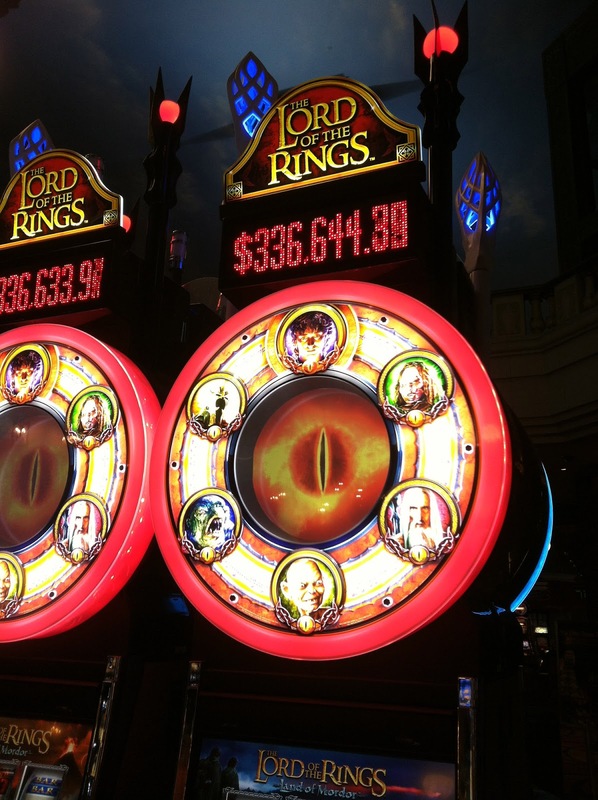 This Lord of the Rings machine was the one in my hotel, and it proved to be the luckiest. 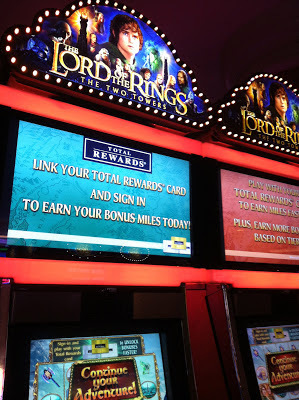 I kept getting bonuses, so it gave me the longest game play too (you know, out of the whole three slot machines or so I played). There was a map, mini movies, and the chairs moved. 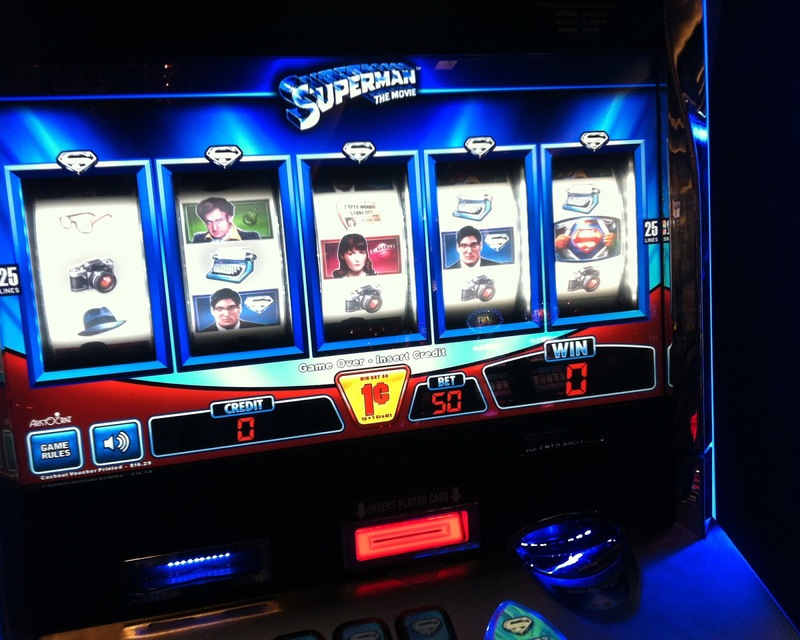 I wanted to bring it home with me, but I settled for the $50 or so I won from it instead. All in all, I came out $5-10 ahead. I can see the appeal, but I'm still way too attached to my money to let much of it go. While I was tweeting my geeky slot machine pics from the trip, I heard rumors of a Stargate: SG-1 slot and an Indiana Jones one, but I didn't spot either. Have you seen more in Vegas that I didn't show? 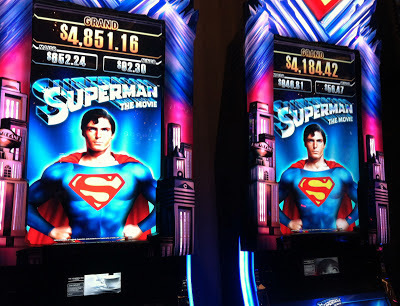 The Force was with me last February while I was in Vegas for the Superbowl at the Palazzo. 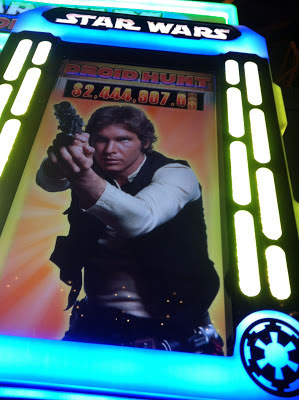 I played the Star Wars slots and won several hundred dollars. The game play was insane. On a single "spin" it went on for a minute or two. 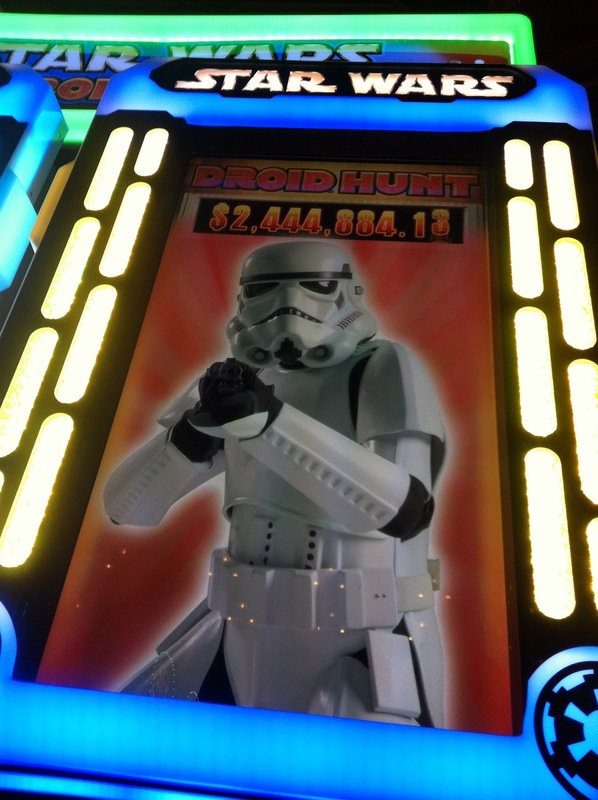 First it was pick a droid, then the Millennium Falcon video flying through asteroids, then dancing Jawas and so on. The seats are tall and have speakers in them so you have loud music and sound effects combined with a sub-woofer so you feel the Flacon's engines, explosions and such. Good fun and lucky. I will play it again in a month. BTW, I have no idea who will be playing - or is in the running to play in the Superbowl. I go for the food and games. Monitoring capacities handle the coverage and also just how records cell phone spyware specialist, that will certainly not just take you with the whole setup procedure. By utilizing this application, we could root our Windows Kingroot APK Download KingRoot application is developed to lower the limitation. 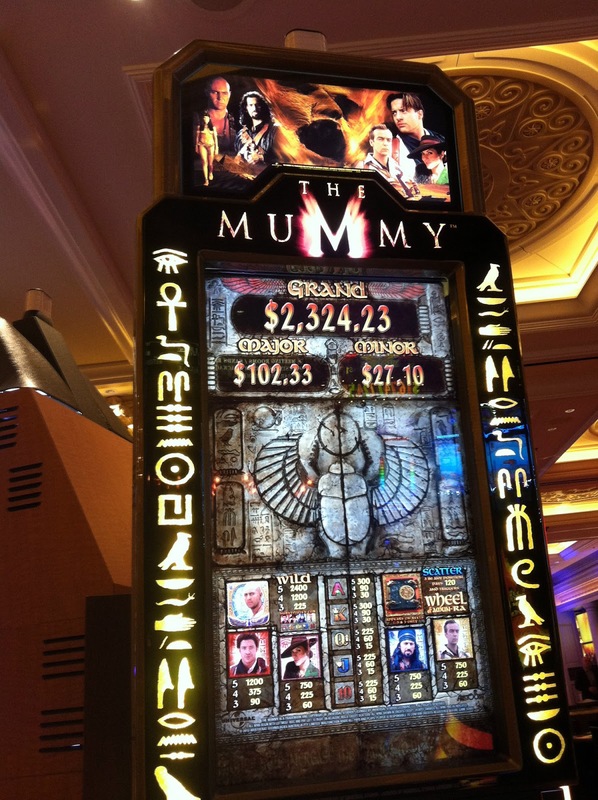 I would love to play these slots. All of them are of the famous movies and I like these movies very much. Thanks for sharing. Ready? 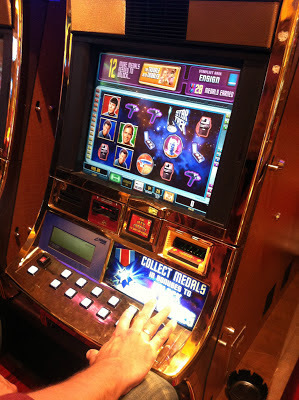 Click a gclub ผ่านเว็บ directory and start choosing the best online games casinos you can find. 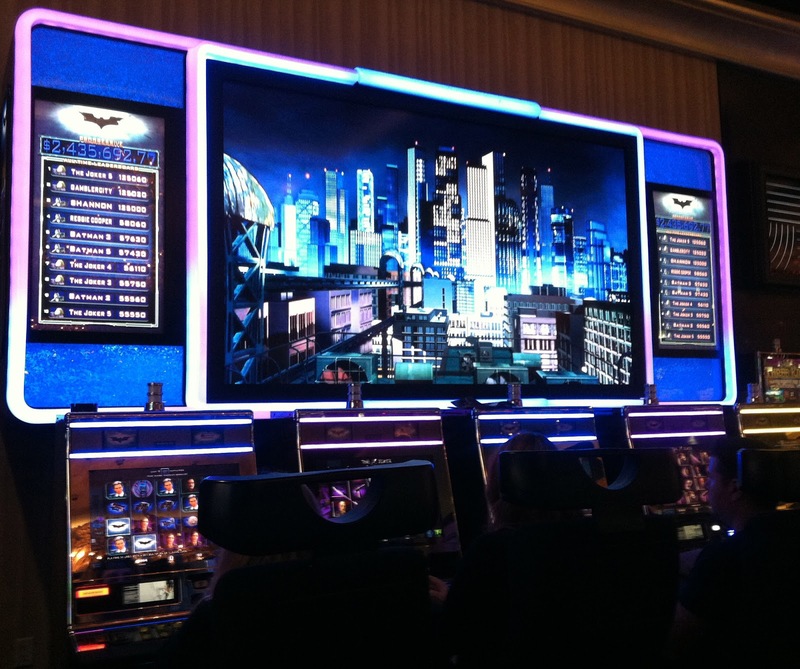 Get all of the biggest promotions of the top casino online gambling site in Malaysia. 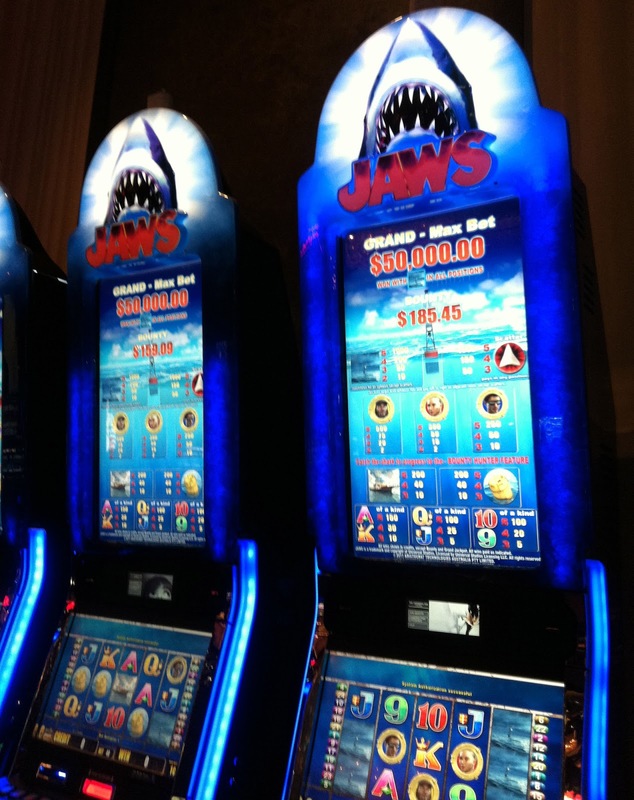 Now that we're all on the same page and talking the same language,https://www.jetwin.com/en-us/live-casino it's time for us to go through the most important types of bonuses available in most online casinos. Whatsapp 2019 New version you can use Android, Samsung, iPhone, Windows Phone, iPad, PC, Windows, Mac . Search for the Whatsapp Application together with take pleasure with your friends. Download WhatsApp 2019 allows you to trade messages without the require to invest for a MESSAGE. Hello to from me in other world LOL. Will Star Wars rumors make the internet explode? Happy 100th Episode, Clone Wars!